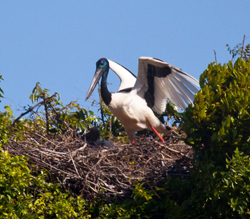 Summer is the time of year when you can see the Jabiru in the freshwater wetlands around Casino, Lismore, Coraki & Tuckean Swamp, in the northern rivers of NSW, Australia. 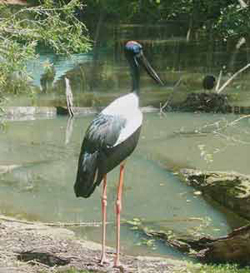 The Jabiru or Black- necked Stork is Australia’s largest wading bird and our only stork. It stands 1.3m -1.5 m in height and its wingspan is a massive 2.3m from tip to tip. The head colour is an amazing glossy, shimmery, black with blue, green and purple. They have very long bright red legs and a straight black bill which is used to scoop and probe in the water for their food. Food consists of small invertebrates found in swamps and wetlands. Frogs, tadpoles, fish, eels and wetland plants are therefore its main food source. Males and females have only one defining difference. The female has yellow eyes. We have also observed, that often the male may be larger in size and can have a bigger head. Young adults/juveniles can be distinguished from the adult birds by a greyish plumage on their chests. 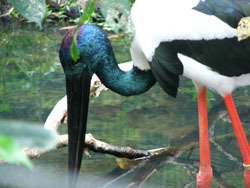 As the Jabiru does not have a voice box, chattering by bill clapping is their means of communication. This very impressive black and white bird is listed as endangered, not only in Australia, but worldwide. Once plentiful right along the east coast, their numbers have dramatically declined. 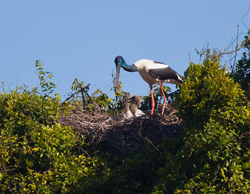 They continue to breed in the northern NSW river valleys, however few nests occur within each valley. They are now considered extinct throughout much of NSW. 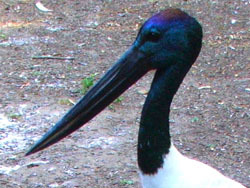 The Jabiru mates for life but will re-mate if a partner is lost. 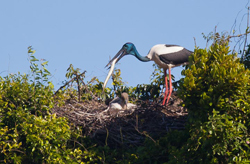 They often are seen feeding alone or in a family group of 3, where strong bonds are formed. Families roosting together on the ground near food sources is another bonding trait. Once thought of as nomadic or migratory, recent research is now suggesting that neither is correct and it is simply that they have a huge home range of 10,000 hectares. More research would give a clearer picture regarding home range sizes and preferences and social interactions. The wetlands of NE NSW is considered an important nesting ground for the Jabiru's. So why are their numbers declining? Even though we still have wetlands, most of the vegetation has been modified (cleared or fragmented). Drains have been established to make way for grazing land and pollutants from fertilizers are adding to the situation.Their once secretive nesting sites, next to their food source, have in many cases been exposed, leaving very few alternative sites. 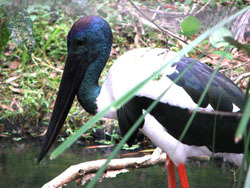 The Jabiru requires intact dense habitat consisting of large trees near or next to a watersouce to survive. As a consequence, of disturbance to this habitat, breeding has dramatically decreased all over the world as well as Australia. 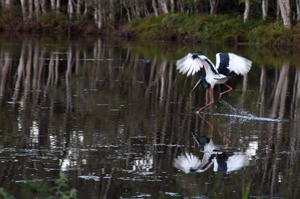 Re-planting around billabongs and wetlands is considered an important process for the Jabiru's recovery. 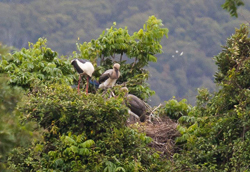 Both parents share the job of incubating 2- 5 eggs on a large 2m diameter platform made of sticks. Usually only one chick will survive, which is another reason why they are unable to increase their numbers quickly, even in safe habitat. Electricity lines have also had a grave effect on the population. 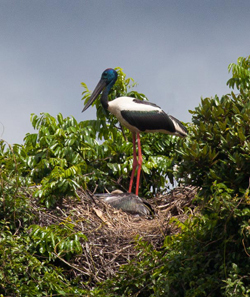 In an attempt to assist in their recovery and the survival of the species, the Threatened Species Recovery Plan has now placed tags on many of the powerlines lines near known nesting/feeding sites. 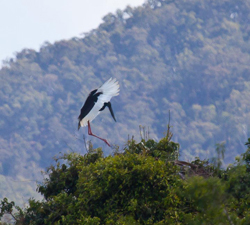 As you can imagine, the Jabiru's large wingspan can make navigating around powerlines quite an issue. Early in March, Mel (WIRES Bird co-ordinator), Alicia & Shaz (WIRES National Parks liaison officer) went on an expedition to have a look for these beauties. Our efforts were rewarded by a chance glimpse at these elusive birds. There had been plenty of rain and we knew all the wetlands were full of fresh water. We didn't find any in all the usual billabong's and swamps and were getting a little disillusioned. So we decided to try some back roads. With the use of our trusty binoculars we finally spotted one glorious bird. To our delight we found a pair. 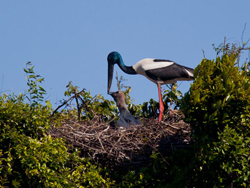 Then to our amazement, off to one side was a young Jabiru. That just made our day. Of course you can’t get very close to these birds, so viewing them through binoculars was our reward. 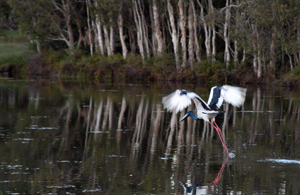 We didn’t want to disturb them and were thrilled that we could now report these sightings to the NPWS Atlas. What is truly amazing, is that we have these wonderful creatures in our own back yard. Who needs to travel the Asian wetlands or go on safari in Africa when we have so many amazing critters right here in the northern rivers. 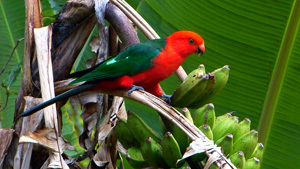 Ref: DEC/NSW threatened species website.